Finally! Organic chips! 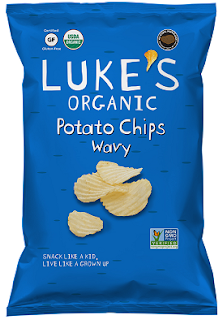 I was so tired of "having" to buy non-organic chips simply because I couldn't find organic ones for sale. Now my problem is solved. It is not cheap, but I managed to get a good deal last week. I wish they sold this in bigger packages (like the Kettle Brand's 450g one), so that I could get a better price. I loved that the ingredients are simple and (of course) that there is no refined sugar. The chips taste good. They are not too fatty nor too dry. It's also quite low in salt, which is great for most people (except for low blood-pressured beings like me, who need a bit more salt). I will definitely buy this again (on sale) and keep hoping to see a bigger package in stores soon.